Last week’s Friday morning was a break from my usual routine. Instead of heading to Manchester’s Northern Quarter to finish off the week’s work, I found myself speeding through the beautiful Yorkshire countryside on my way to Wuthering Bytes festival in Hebden Bridge. One of the sessions I’d been most excited about was Dr Lucy Rogers’ talk about ‘Hacking Robot Dinosaurs’. With a name like that I knew it would be an interesting start to the day – and it was! 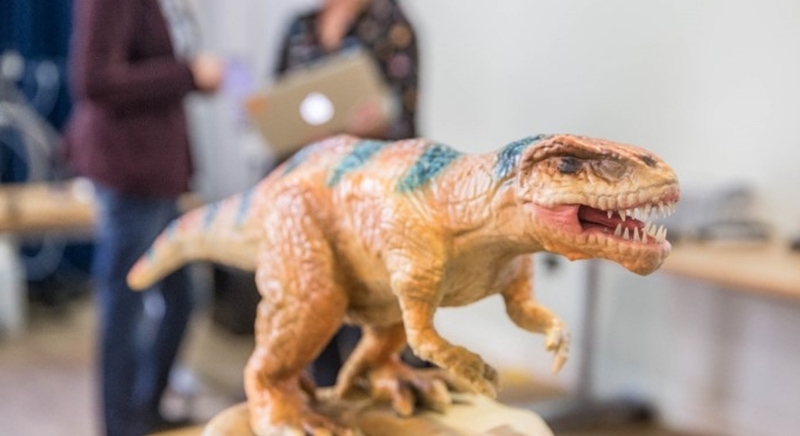 Dr Lucy, who is a judge on the BBC’s Robot Wars, explained how she’d helped the employees at Isle of Wight’s Blackgang Chine learn to code so that they could control and fix the Dinosaurs at the park. The best bit? We got to control a mini-dinosaur by tweeting! A simple tweet using the hashtag #WakeDino would get the model to roar – the seven-year-old within me was delighted! But perhaps the biggest thing I took away from the festival was to be open to new ideas. Some of the talks which I enjoyed the most were those which lay outside of my usual interests. Take for example, Rachel Coldicutt’s session about prototyping. Not something I’d previously thought to look into, but it provided some really interesting insights into how prototyping can make technology work for everyone, especially the most vulnerable in our society. Or Phillip Roberts’ demonstration of a magic lantern. I’ll admit that, perhaps embarrassingly, I wasn’t really sure what a magic lantern was before last Friday (it’s a projection tool, FYI). But the slides he showed were truly beautiful – a real feast for the eyes! That’s the great thing about festivals, whatever they’re celebrating. The sheer volume of talent to see means that you might end up discovering a new favourite band, food, or – in this case – field of technology. I left Wuthering Bytes feeling inspired, and with a long list of things to find out more about. I’m already excited to see what surprises next year’s festival brings!